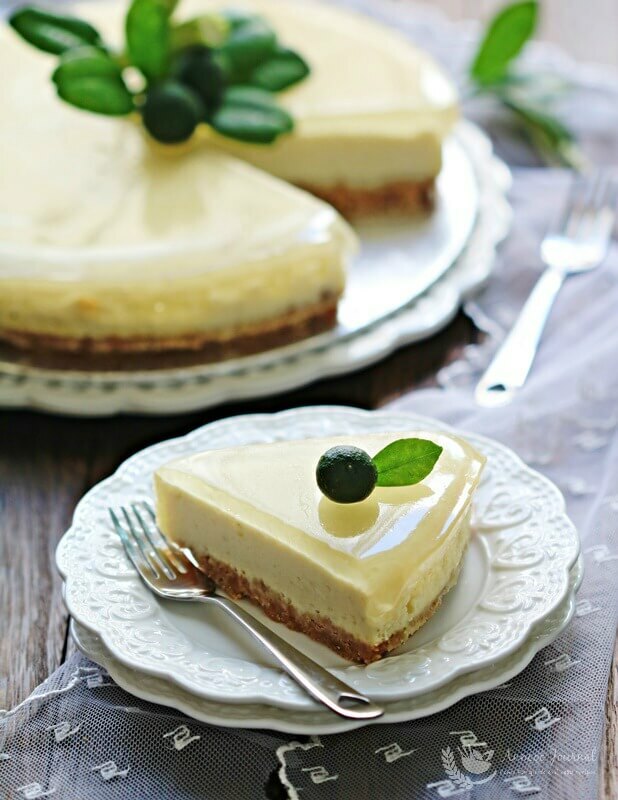 This delicious and refreshing baked Lemon grass lime cheesecake can be made very easily. This is another perfect cold dessert with flavours of the tropics to be enjoyed on a hot day. I’ve added coconut milk in the cheese filling and the cake was bursting with the natural flavours of lemon grass and tangy lime. 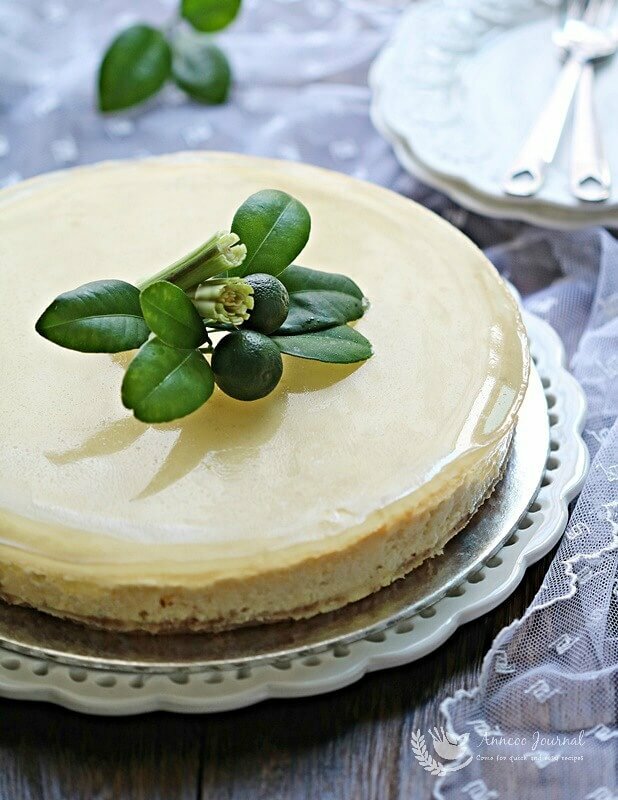 The lemon grass and lime jelly top layer made the cake more tantalizing your taste buds. 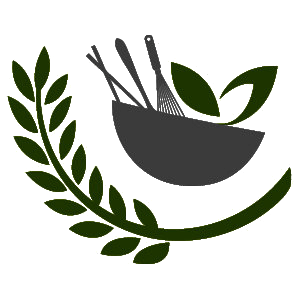 Remove the outer part of lemon grass, clean and bruise the white part with a knife. In a small pot, add coconut milk, lemon grass and lime zest together, under medium heat to almost boil. Cover with a lid and cool down coconut milk. Then strain coconut milk mixture through a sieve. Biscuit base - Crush biscuits with a rolling pin in a zip lock bag until they are like crumbs, then add melted butter and mix well. Pressing the biscuit crumbs with your hand at the bottom of the lined greased cake pan (use a removable 8 inch round cake pan). Put the tin in the fridge for later use. Cheese filling - Beat the cream cheese and sugar at low speed, gradually pour in coconut milk (step 2), then change to medium speed, beat mixture till smooth and add lime juice. Lastly beat in the eggs, one at a time until combined, followed by lime zest and cake flour, mix well. Jelly topping - In a small pot, boil water, sugar, lemon grass and lime zest together at medium heat for about 2 minutes and strain mixture through a sieve. Return the liquid in the pot, heat up and add lime juice and soaked gelatin into it. Stir until gelatin melted and leave liquid to cool before pouring onto cheesecake. 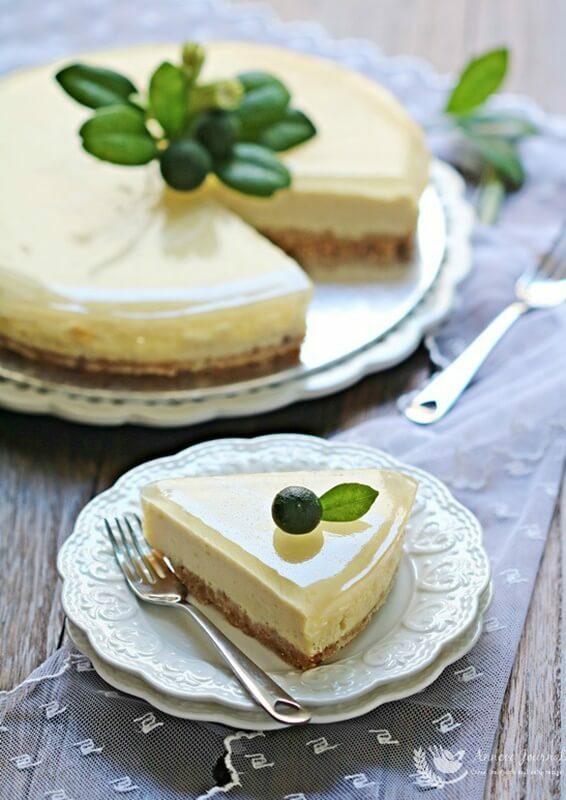 Chill cheesecake in the refrigerator until gelatin set for a few hours before serving. Just to double check–is the cake pan placed in a tray of water? Or do we place the cake pan on a rack but place a tray with water below the rack, ie the cake pan does not come into contact with water? Thanks. Hi Siew Boey, I placed the pan of water below the rack and the cake pan on top. You can see the pic in the step by step above. Hi Ms. Low! Such an exciting recipe! I’m very tempted to try it. But I cannot eat coconut milk. Can I substitute it with something else like milk or evaporated milk? What do you suggest? Thanks so much! Hi Faye, you can use whipping dairy cream. Does the cake has strong coconut taste? Can it replaced with fresh milk? No because there is more lime juice added. You can add whipping cream if you prefer. So beautiful! I have never had a cheesecake made with lemon grass. It must be amazing!